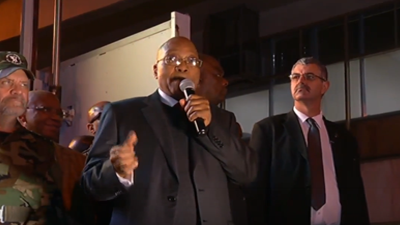 President Jacob Zuma of South Africa survived another vote of no confidence on Tuesday and the 8th in his presidency. This time, the opposition was able to get 26 ANC members' votes in the bid to remove Zuma from office, instead of the 50 ANC votes required. Consequently, Zuma is basking in his victory, saying tricks to defeat the ANC will fall short and the ruling ANC is undefeatable, while the opposition is saying that 26 ANC members' votes against means that the ANC supports the motion to remove Zuma from office, and that those ANC members stand for South Africa and not Zuma. There are 150 opposition members in the parliament and 249 ruling party members. 177 voted in favor to remove Zuma from office, 190 voted against it 9 abstained. The opposition is till asking Zuma to resign from office, because according to the opposition, the votes by members of the ANC against zuma effectively shows Zuma as a dead president walking him, despite Zuma's walk over the vote of no confidence with 24 votes. It was a tough situation for many of the ANC members threatened with recall if they voted against Zuma. Some of the ANC members openly defied their party and told others it was time to follow their mind and not be subjected to the dictation by the ANC. Now that the chicken has come home to roost, what will become those brave ANC members who spoke bravely and also voted with bravery?